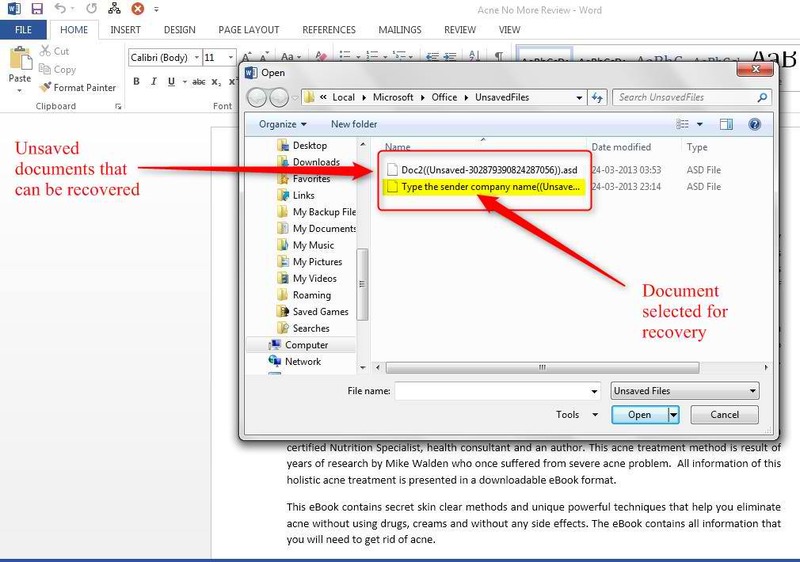 Summary: How to recover unsaved word document on Windows or Mac OS? This article tells you the easy 4 methods to help you recover a lost document. Indeed, Word documents or Excel sheets are one of the essentials of our busy typing life. From schools to official reports, they are playing a big role in today’s digital information exchange. But sometimes when you’re typing a very long report for your today’s sales summary, a power outage suddenly shocks you, or a Blue Screen of Death/hardware failure crashes, making your word document accidentally closed without saving after computer restarts or shutdown while you’re on progress finishing it. How to Set the Default Autosave Period on Microsoft Word 2010? Word processing software such as Microsoft Word has a feature called “AutoSave”. This feature makes your document saved in a set of certain time (example: Microsoft Word automatically saves your document every 10 minutes by default). If you didn’t save your document Microsoft Word 2003, 2006, 2010, 2011, 2013, 2015, 2016, 2018 before any power outage or a critical error comes, use this feature to check the last auto recovery word document. Sometimes there are 2 or more versions of the AutoSave word document, which you can review at the same time. To check them, double-click the document available for recovery to review it. It will open another window. If the document didn’t prompt the AutoSave Pane for you, you can still browse its default AutoSave folder by going to “File>Info>Manage Versions” and select “Recover unsaved documents” An open window will appear to select your possible unsaved word documents. But take note, if you ignore the AutoSave prompt on your document, next time you open your document, it will not be available anymore for recovery, so do read carefully on what you’re clicking! Double-click the .asd file to open it. Go to File > Option > Save > Save Autorecover information every 10 minutes to another number as you need. 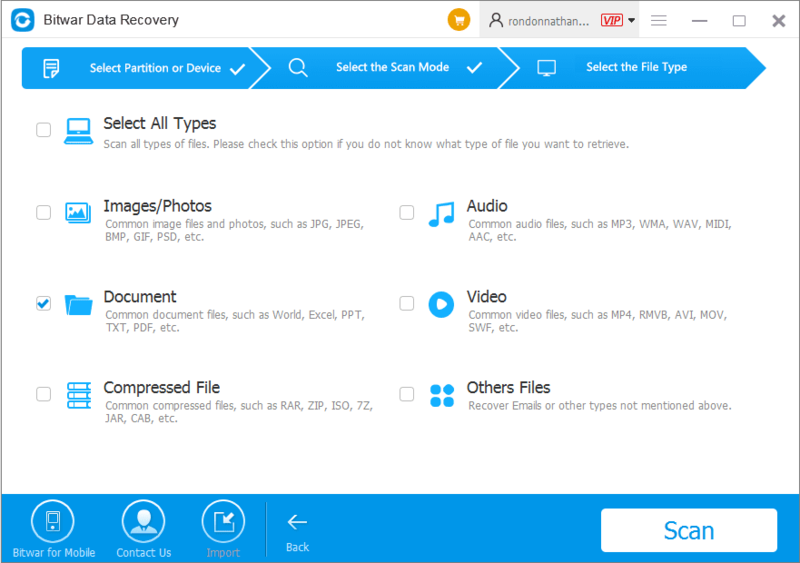 If the AutoSave feature and search for the .asd file don’t work, there are recovery programs can help you retrieve your lost document files such as Bitwar Data Recovery Software. It can help you recover your lost Word Documents after accidental deletion or forcing to exit without saving. Before you start recovering your documents, make sure you didn’t overwrite or put any new data to your storage device. If you copied, moved or created any new file to your storage device or target folder/directory you want to recover makes the files corrupted as you recover them, so be careful! Launch Bitwar Data Recovery Software. Select the storage device where your document was last saved such as your main hard drive, external hard drive or flash disk drive. Click Next to proceed to the next step. Accidentally deleted your document, or being deleted by another program? You can select the Quick Scan first to run the fastest scan to search for your lost documents, and turn to Deep Scan later if the Quick Scan doesn’t work. Click Next to proceed to the next step. At the “Select the File Type” Selection, just check the “Document” to recover all possible document files such as Text Files, Word, Excel, PowerPoint and PDF Files. Click Scan to start scanning your storage device for possible documents available for recovery. Please wait as the program scans your storage device for all possible document files. Then preview the document after scanning. Hit the Recover button and select the path to save the documents. Select the documents you want to recover, and click Recover. You will see a popup windows asking you to select “Recover while maintaining the original directory structure” and “Restore to the same directory”, Simply choose recover documents with original folder structures and Click OK. Tips: Don’t Save the files back to your drive or partition where contains your lost documents. If you managed to recover unsaved word document by using above-explained methods, then that’s it! 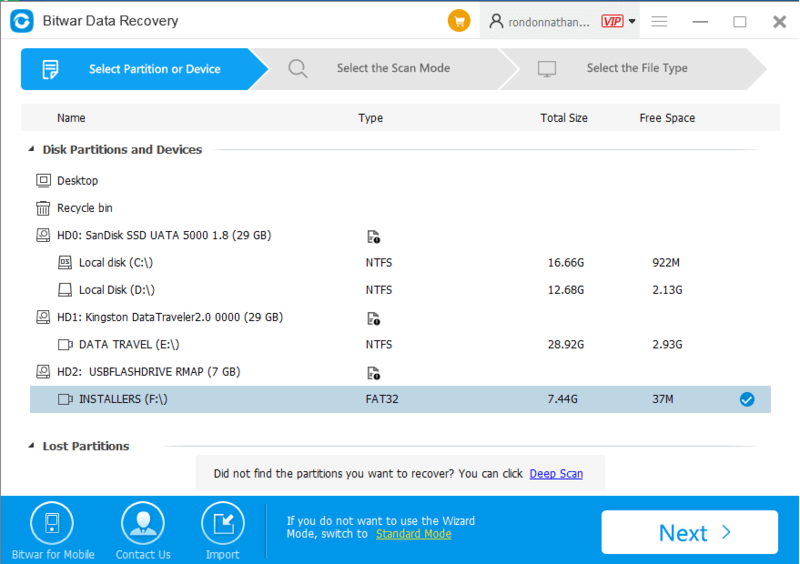 And what if you lost the word documents accidentally and you couldn’t access the world autorecover backup file .asd, then you’ll probably need the third-party data recovery software – Bitwar Data Recovery to help you recover. What can I say… didn’t work the .asd thing, as suggested downloaded Bitwar. Surprisingly good, very efficient and simple, less than 20 min my problem was fixed. I’m impressed and happy! Great work! Hi, Lexi, we are also happy that the solution can work to solve your issue. And we are 100% agreed with it was a great work that we can restore the lost document on our own. Have a nice day. Amazing how easy it was using the software, missed the file autorecover so after some research ended up here. The software worked great, very smooth. Was wondering about how this works, is there any time limit for the file to now show up in the software? For example, if I wait a week to use the deep scan, would the file still be there? Thank you! Hi, Dillon, the sooner you get back the files, the higher success rate you will get. Let me explain to you: Once the document was deleted, the system just delete the address/path of this file which you can not see the file there existed in the original place, however, the storage place is marked as free for write, though, if you keep writing something new into your hard disk, the operating system considers you don’t need the deleted document anymore, then it will let the new data to be stored into the place where belongs to the document you need, then, document is gone forever! Therefore, if you wait a week to use the deep scan, you might get the result that the document was corrupted or even the worst situation is the document can’t be found in the software forever! So, the best way to retrieve your document file is to use the software soon as you are finding the data loss. Anything you need the support from us, please don’t hesitate to let us know. WOW! thank you so much for replying to me! Great explanation, it makes a lot of sense! very enlighten to me, thanks! Makes sense way things that have been deleted can also be restored! Thank you for sharing information, guides and the great attention to the users! You are always welcomed, Dillon, we are glad to help you further if you are still feeling puzzled with the issues. Have a nice day. Glad to have a second chance for my file, coudn’t acces the .asd I though everything was lost. Didn’t knew about data recovery softwares, Glad I could try Bitwar. It was simple to use honestly, after solving my issue and checking other articles I just realized that this software works for a lot of things haha, nice work! Yeah, Marlon, we are also happy to see our data recovery software can work to resolve your issue! Wish you a nice day! My favorite function of the Bitwar Data Recovery software!!! I think all the ways to recover the word document are simple, but having all in 1 software is way more easy. These types of things are daily troubles, if it’s not the usb, is the disk, or the phone, or the word document, etc. Great investment to everybody, that’s my recommendation! Thanks for your recommendation, Jakie, have a nice day! Best solutions ever! Didn’t imagine it could be so simple! Thank you! Very helpful, worth it! I’m speechless but very happy to have my document back! Wish you the best! YAY!! Got my file back!!!! It worksss! The program is aweesome! You should all try if you are having issues with your files! I already had the software, I needed it for my USB and external HD so long ago I got the life time version, it is pretty easy to use, 100% worth it! The best part is the customer support, they help you with everything and pretty fast reply, so good job! Okay, this was great, everybody should know this! Easy step by step guide! Got my file back in like a minute! Thank you guys! I’m glad I found this, thank you! Very simple explanation, I could easily get my file back! Now I just have to continue my essay and finish it haha! Great job! We are happy to help get back your essay. Enjoy your days. Great guide, complete and simple for everybody, love it! Already used Bitwar over a USB flash drive issue, so I also decided to check how to use it in this cases, because for me, this word issue happens very often (yes, I’m that lucky). So anyways, thank you for your work, aprreciate it! Hi! Indeed the AutoSave feature is not always available (the first method) but the second way to recover documents with AutoSave is there, as you guys said in this article, if you click the wrong thing, you will finally loose the document, as I did (For not reading the entire thing, sorry), can I still recover it with your software? even if it doesn’t show up anymore in the UnsavedFiles folder??? Thank you! Try our data recovery software to scan the .asd file which is located in “C:\Users\UserName\AppData\Roaming\Microsoft\Word”, and then if you are lucky to get back this backup file, save to “C:\Users\UserName\AppData\Local\Microsoft\Office\UnsavedFiles”, then, Launch Microsoft Word and choose File > Info > Manage Version > Recover Unsaved Documents, in the end, Double-click the .asd file to open it. THANK YOUUU! Such a fast reply very helpful information! It worked perfectly, thanks! Not enough words for thanking you, but i can see what caring for customers looks like <3 thank you very much! Hello! Word documents are the most common tools between students and workers (most areas), I think is very important to share this information, so it’s great that this websites does that. This is the most common frustration for what I have seen with word. I was wondering if I canuse the software with the same account in different computers? Hi, Tec, you are allowed to use the software in different computers once you purchased the lifetime license (3 PCs supported). Life-saving information! well, file saving haha! Thank you! The first method worked perfectly, but the bitwar software looks great, and for a huge variety of issues, right? can someone tell me how long is the trial version or the price? or where can i check that info? Thank you! Hi, Madeline, you are free to restore the lost data in the initial 1024 MB for free. After the trial, you can purchase the annual license (49$ Best Selling) or Lifetime license (99$), the payment is a one-time fee, no subscription plan. All decisions made on your own. Fast and efficient way to deal with this issue! So happy i found this. I guess this methods, including the software, can be used in any Microsoft program, right? like power point or excel? Thank you for your time! Yes, the software support to recover the document file(word, excel, power point and so on). This article just saved my paper! Thank you! very clear, simple and useful information!. Keep sharing your knowledge to the world! Bless you! Hey, just want to say that the software Bitwar is pretty easy to use, very intuitive I must say, already used it for a couple of things and it’s been great. Thank you for this step by step guide, everything worked perfectly! That’s nice you are happy with our data recovery software. Thanks. Thank you! I knew about the autosave feature long time ago, but for no reason I couldn’t use it last night, then I found this article. I used the .asd backup files to have my essay back! Thank you very much, very helpful.